Having physical limitations does not have to prevent you from seeing the world. Whether you use a wheelchair full time or have one for backup and going for longer distances, travelling is not only possible — it’s also fun. I’ve used a wheelchair since I was 16 years old and in it, I have visited several countries in Europe, Romania when it was under communist rule, Las Vegas and California, both coasts of Canada, and more. I’ve seen the ocean, the mountains, and the desert, been to cities and the countryside. Every trip was an adventure and I treasure the memories. That said, once you add the extra coordinating required for mobility equipment, it can get ... shall we say “interesting?” In order to have a trip that’s enjoyable and emphasizes fun, it’s a good idea to plan ahead on a number of vacation elements. If you travel in the United States and Canada, you can be pretty sure that there will be a fairly uniform level of accessibility, particularly in larger cities. Europe can be a bit more challenging as a lot of buildings are very old, and countries in the developing world may only have rudimentary accessibility or none at all. Where you go depends in part on your mobility, what kind of wheelchair you have — manual or power — and your comfort level with uncertainty. There are a number of websites dedicated to travel for people with disabilities that can help you in your search. 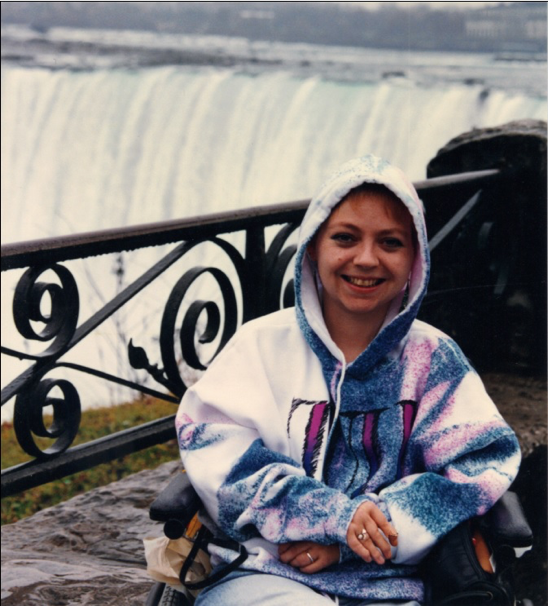 Lene in Niagara Falls, 1991. The websites of individual airlines, cruise lines, train services, and so on have information specific to the traveling with a wheelchair. Book your ticket as far in advance as possible — there may be limited wheelchair spaces available. If you’re flying, book a bulkhead seat at the front of the plane where there is more legroom. 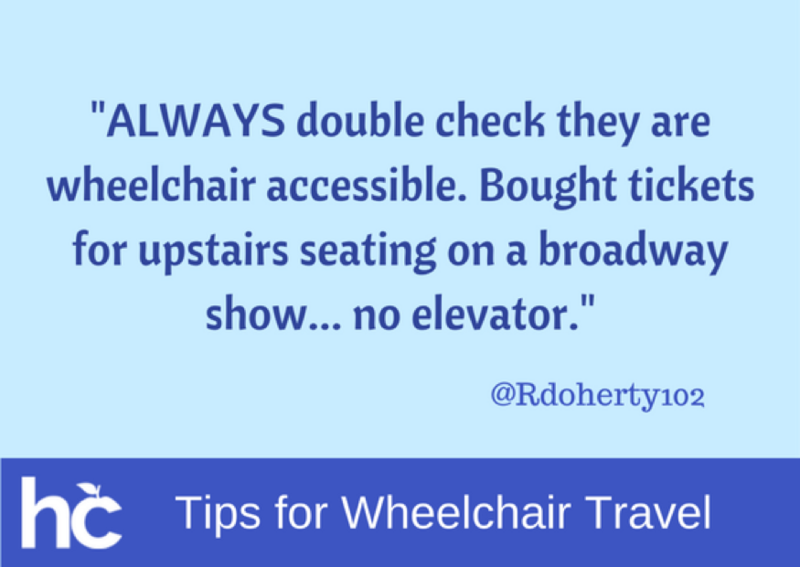 Double check your ticket about a week before you leave, just to make sure that the information you have is still valid and that you are booked as a wheelchair traveler. Get there early on the day of your trip. Back in my travelling days, there were always extra complications to deal with when arranging to ship my wheelchair. Pro tip: Make sure to label all the parts of your mobility equipment with your name and contact information, as well as the luggage tags you get for your suitcase identifying where you are going. If you are bringing medication on your trip, pack them in their original containers in your carry-on baggage to make sure they don’t get lost. The label should include the name of the pharmacy and your doctor. Also, the name on the label must match the name on your boarding documents. You should ask for a letter from your doctor explaining the medication. If your medication needs to be kept cool, make sure you have the right equipment and know what to do. If you need vaccinations for the place you’re visiting, be aware that certain medications can affect which travel vaccines you can take. You may need a waiver letter from your doctor. We all hope for a trip filled with only the fun kind of adventures, but there are no guarantees. Make sure you purchase medical insurance before you leave. That way, should you get sick or be in an accident, you’ll be covered for medical costs and the transportation home. 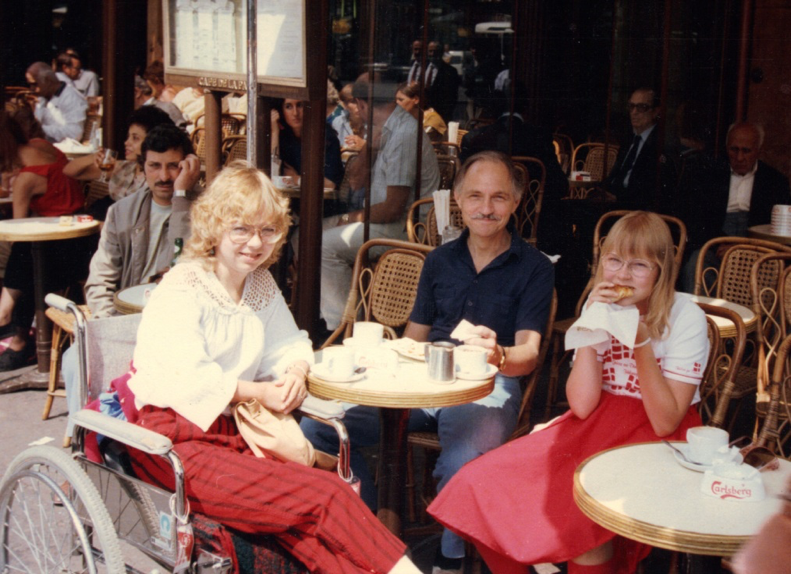 Lene eating croissants in Paris with her father and younger sister in the mid-1980s. It’s a good idea to do extensive research before booking a place to stay. Think about what you need, not just in terms of accessibility within the hotel, Airbnb or hostel, but also in the immediate environment. Your needs are going to be different if you need parking for an accessible van or access to public transit. You should also be clear about the accessibility features you need in the building and room in which you’re staying. There are some truly creative interpretations of accessibility around the world. I still remember having to enter a luxury hotel through the freight area at the back. Not exactly dignified but hey, I was in Paris. Everything is better when you have a view of the Eiffel Tower! Think about what you need in the room. For instance, you may need the bed to be of a certain height, a roll-in shower, an elevated toilet seat, and so on. Then make some phone calls to find out whether those needs can be met in the places you’re considering. If you use a wheelchair, you already know that this kind of life involves a lot more planning than that of an able-bodied person. Sightseeing is no exception. Doing some research ahead of time to find out what you’d like to see, how accessible things are, and how to get to where you want to go can reduce frustration and enhance your adventure. Many people in our culture look at a wheelchair as a limiting type of equipment and using it means giving up and surrendering to disability. They don’t understand that a wheelchair can set you free. If you aren’t able to walk at all or only for very short distances, a wheelchair will enable you to go further, experience more, and see the world! “Don’t worry, she won’t get far on foot.” Mid-90s Valley of Fire homage to the cartoonist Callahan. 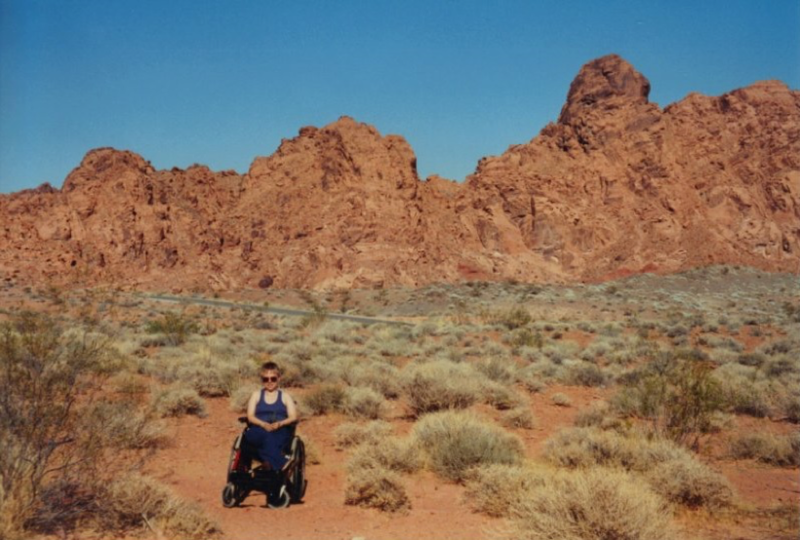 Lene in the Valley of Fire, 1994.